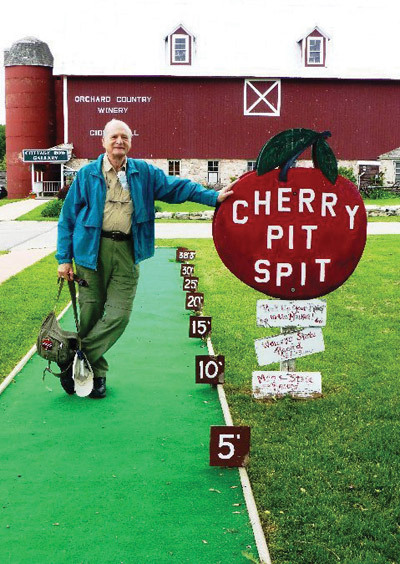 A cherry pit spitting course complete with distance markers. Jeanne O’Connor photo. The ferry to Rock Island deposits passengers in a state park without cars or electricity. Reservations for primitive campsites can fill up almost a year in advance of the season. Far removed from any light pollution, this has got to be one of the best night-sky-viewing places I’ve ever visited. Short driving distances between villages and other places of interest on the peninsula are easily managed, allowing visitors to tour much of the area on their own with the aid of the numerous available free brochures. But a time-saver when it comes to finding special places to visit is to take one of the many Door County Trolley narrated tours. Experienced drivers/guides relate tales about local history, visit villages and out-of-the-way places that visitors might never discover on their own. Not to be missed is the area’s famous Fish Boil at one of the eateries featuring this treat. The fish boil was originated by Door County’s Scandinavian settlers more than 100 years ago to economically feed large groups of fishermen and lumberjacks. My first experience with one was at Rowleys Bay Resort in Ellison Bay, which also has a large restaurant facing a bay of the same name. Water in an iron cauldron is brought to a rolling boil. At the proper time, the “chef” adds kosher salt, onions, red potatoes, veggies if desired, and then chunks of fresh local lake-caught white fish while the fire is being tended to. For the finale, kerosene is poured into the ring surrounding the pot. It creates a very hot fire that can easily soar to 10 or more feet, sending the scum on the top of the ingredients that have been cooking in the pot out over the sides, including the grease and fat from the fish, removing any fishy taste. At no time, despite the intensity of the fire that stuns and amazes first-time viewers, is any of the food burned. The final product is delicious chunks of Lake Michigan white fish. Door County, recently named a Top 5 summer getaway, is also a hotspot for winter visitors. The area gets enough snow to host winter activities — as I saw by the extension on a fire hydrant in Sturgeon Bay that sported a bright orange plastic flag on top, giving me a hint at snow accumulations. Because of an amazing number of restaurants, wineries and other places of interest on the peninsula, I can only report on the ones personally visited, and even then there is not enough room here for me to do justice to all that I did visit. During my visit to Door County, I found that all of the restaurants at which I stopped had delightful, knowledgeable servers and generally unhurried service. I don’t mean slow, I mean relaxed. Of special note is Wilson’s Restaurant & Ice Cream Parlor in the village of Ephraim. Opened in 1906, it is a landmark. As would be expected, this is not a new-era chrome-and-glass experience. The soda/food counter, original Wurlitzer jukebox, and other remnants of the past make for an old-timey atmosphere where families keep returning generation after generation. The food is good and portions generous, but keep lots of room for the ice cream specials. Breakfast was shared with friends at Door County Coffee & Tea Co. in Sturgeon Bay, a mecca for coffee lovers. Their coffee experts buy beans from around the world and import only Specialty Class 1 Arabica beans, which are then roasted and ground on the premises. Their specialty coffees are available to take home, and there is a restaurant in which you can try their coffees while dining. Wineries are a major attraction on the peninsula. The largest and oldest is Door Peninsula Winery and Distillery in the village of Carlsville. A more laid-back wine tasting experience was to be had at Harbor Ridge Winery in Egg Harbor. This is Door County’s newest winery, and the owner has a sense of humor when it comes to naming his wines. Displaying some of the labels at home is sure to bring smiles to the faces of your guests. Did you know that Cherry Pit Spitting is a competitive sport? Check out the Orchard County Winery & Market in Fish Creek. They have acres of cherry trees whose fruit, when harvested wind up in wine, pies, juice and jams, or bought whole. They can be bought whole or ground. Just remember to spit out the pits — which you can do on their marked “Cherry Pit Spit” course. Readers might feel there is too much emphasis here on wineries. Well, they are hard to miss when driving the local roads. The signs are everywhere. However, they are a major part of the local experience and are well spaced for convenient stops. More information for your trip planning can be found on the excellent website of the Door County Visitor’s Bureau at DoorCounty.com.